The whole of the interior of British Columbia river’s empty out into the Pacific Ocean, through the Coastal mountain range, and offer’s an amazing array of paddling adventures and classic kayaking runs. On our BC Road Trip, we head up the Fraser, to the Clearwater, and over the mountains to Whistler, taking in the prime spots and famed rivers. The river selection is vast, pool drop fun on the Checkamus, alpine fun on the Stein, big volume on the Clearwater and Thompson, waves to surf, drops to boof and boulder slaloms to nail, a slice of everything is BC. And of course BC is beautiful, full of pristine wilderness and from your kayak, you’ll get amazing access to nature and the grand surrounds of some of North America’s best white water. 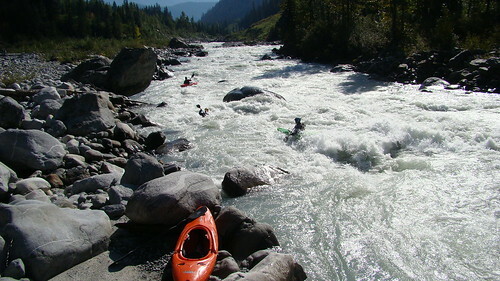 BC Road Trip takes place on Class III/IV whitewater. The BC Road Trip is suitable for experienced paddlers who are able to paddle for 3 – 4 hours in a day on Class III+. Generally the rivers are accessible with far road access, but occasionally there may be some exposed terrain. This trip begins on an easier section of whitewater, but will soon reflect conditions expected at the grade. Participants should therefore expect to be in a river environment during peak runoff for sometimes extended periods of time. * The BC Road Trip Picks up from Vancouver Airport 1700-1800 on the Day of Arrival, and Drops off at 1000 on the Day of Departure.